University of Delaware undergraduates won five first-place awards at a regional research symposium in chemistry and biology. 9:17 a.m., Nov. 7, 2014--Nineteen undergraduate science students from the University of Delaware presented their research on Oct. 25 at the 17th annual Undergraduate Research Symposium in the Chemical and Biological Sciences, a competition that drew nearly 250 students from 14 states. 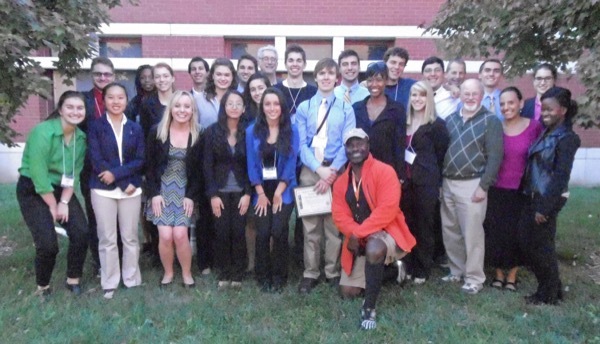 UD students competed in 18 of the 36 groupings at the symposium, held at the University of Maryland, Baltimore County, and received five first-place and four second-place awards. The students' attendance at the symposium was sponsored by the University's Howard Hughes Medical Institute (HHMI) Undergraduate Science Education Program. “This continues a tradition of excellence established by UD students at this competition” over the past several years, said Hal White, professor of chemistry and biochemistry and director of the HHMI program at UD. White and five other faculty members  David Usher, professor, Gary Laverty, associate professor, and Carlton Cooper, assistant professor, all of biological sciences; Jacqueline Fajardo, assistant professor of chemistry and biochemistry; and Angelia Seyfferth, assistant professor of plant and soil sciences  accompanied the students. Seyfferth was a student participant and award winner at the 2002 symposium, when she was an undergraduate at Towson University.